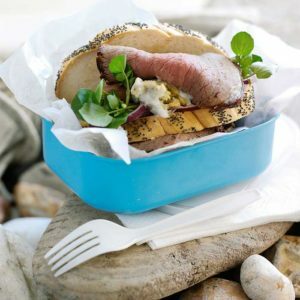 Celebrate a special occasion, or end of term with a treat of a nice juicy steak sandwich. Minute steaks get top marks for taste and value! Mix together the mayonnaise with the blue cheese and the garlic. Take each bread slice and spread with the blue cheese mayo. Top with the roast beef slices. Sandwich together to make 2 sandwiches. Serve with watercress and sliced red onion. This recipe works well with mini roasts too.